Fox Architect Robert Reamer also designed Yellowstone National Park’s Old Faithful Inn. The Fox Theater was built with 2,300 seats, making it the largest in Spokane. Today, it has 1,600 seats. The carpeting signifies the ocean with the murals in the lobby depicting underwater scenes and treetops upstairs. On November 30, 2001, The Fox was placed on the National Register of Historic Places. The Fox Theater was the first air-conditioned building in Spokane. Movie executive William Fox announces plans to build a “million-dollar movie palace” in Spokane. On Sept. 3, the new, multi-use theater holds a gala opening that attracts 30,000 spectators with such movie celebrities as Janet Gaynor and Will Rogers. In one of the live stage shows held regularly at The Fox, Frank Sinatra, member of the “Hoboken Four,” gets into a fight backstage. The Fox adds Cinemascope projection, stereo sound, a bigger screen and 3-D effects. The Spokane Symphony moves to The Fox and stays six years, leaving in 1974 for the Spokane Opera House (now the INB Performing Arts Center). Owner Mann Theaters partitions The Fox into a triplex. The Fox becomes a discount theater, charging $1 for second-run films. Following a successful “Save the Fox” campaign, the Spokane Symphony purchases The Fox, planning to make it their permanent home. A second fund-raising effort begins to find the $31 million needed to restore the building. The Fox, renamed the Martin Woldson Theater at The Fox, opens on Nov. 17 with a gala event featuring the Spokane Symphony with Music Director Eckart Preu and mezzo-soprano Frederica von Stade. Nine new stars are unveiled on The Fox’s Walk of Fame on Oct. 20, honoring donors who are investing in the theater’s future. As the Music Director of the Spokane Symphony, Eckart Preu remembers the day he led the orchestra in the newly restored Martin Woldson Theater at The Fox. “Moving into the Fox, for me, was like moving into your dream house,” Preu said. It was on November 17, 2007, that the Spokane Symphony held its first concert at the newly restored Martin Woldson Theater at The Fox after two community-wide fund-raising campaigns. The Symphony had purchased the 1931 movie house in 2000, saving the Spokane landmark from being turned into a parking lot, while providing the Symphony a home that enhances its performances with superb acoustics. “The Fox Theater changed the way we play, and I think it changed the way the audience can listen to us. As a musician, you are only as good as your instrument. A violinist can play any violin, but if you have a Stradivarius, you try to live up to that quality. For us as an orchestra, The Fox is like that. The hall inspires us to do things we were not able to do before,” Preu said. Preu, who is in his 14th season with the Spokane Symphony, told us that highlights of the past ten years include the 2007 opening gala with mezzo-soprano Frederica von Stade, the 2009 recording session with renowned baritone Thomas Hampson, and last season’s Verdi Requiem with the Spokane Symphony Chorale and choruses from Eastern Washington and Gonzaga universities. “Since we’ve moved to The Fox, our playing, the quality, the delicacy and the sound of the orchestra, has changed dramatically because we want to fill this hall. We live in an age where you can pick up any performance you want on YouTube or iTunes, but there is something about being in a concert hall and hearing a live performance that recordings cannot match. When you sit in The Fox with a thousand or more people, with 200 people on stage, there is a human connection being made. No matter if you have the best recording. It cannot replicate what happens live. The music goes deeper into the soul, and I think when we come here to The Fox we take care of our souls,” Preu said. Just in…two limited-edition 100% silk scarves, designed by local artist Chris Bovey, are available through November and December while quantities last. Now you can take a piece of The Fox’s beautiful interior and brighten up your wardrobe. A great gift idea… Order online at foxtheaterspokane.org. Help fulfill one of these wishes! Your generous support can maintain The Fox’s stature in our community. Please contact Spokane Symphony Development at (509) 464 7071 or jenniferhicks@spokanesymphony.org. In honor of the 10th anniversary of The Fox restoration, a new Fox Family Series started this fall with three selections that appeal to all ages. Each show starts at 7 p.m., so no one is out too late (neither young children nor tired parents!). The Series kicked off with the Underwater Bubble Show on October 13, a modern fairy tale from Latvia, inspired by Cirque du Soleil. It was a rich blend of storytelling, music, dancing, mime, puppetry, juggling and lots of bubble artistry. The Peking Acrobats are next in the Fox Family Series, performing on January 24 for one show only. For the last 30 years, the Peking Acrobats have traveled the world, entertaining audiences with their precision tumbling, gymnastics, flexibility and control. Accompanied by high tech special effects, plus musicians playing traditional Chinese instruments, this will be a memorable evening with all the festive pageantry of a Chinese carnival. The Fox Family Series concludes with Rockin’ Road to Dublin on March 10 at The Fox. World champion Irish dancer Scott Doherty, the choreographer and star of Riverdance and Lord of the Dance, has teamed up with veteran Celtic rocker Chris Smith for an evening of classic Irish tunes, accented with rock ‘n’ roll, an exhilarating variety of Irish dance and a dynamic light show. Tickets are available at the Box Office at Martin Woldson Theater at The Fox, 1001 W. Sprague Avenue, or by calling (509) 624-1200. Tickets may also be purchased online at foxtheaterspokane.org, and at all TicketsWest outlets and 1-800-325-SEAT. The Fox Theater was almost demolished in 2000 to make way for a parking lot. But the community worked hard for years to save it, raising $31 million and pouring endless creativity, energy and passion into the project. Thanks to our many community supporters who restored The Fox and those who have helped it thrive in the past decade! Your generous donations of dollars and time keep the performing arts alive and well at Martin Woldson Theater at The Fox in Spokane. The Fox’s Walk of Stars on Monroe and Sprague acknowledges the generous donations and contributions of many Fox Theater and Spokane Symphony supporters. On October 20, 2017, nine new stars were unveiled, honoring Doug and Gail Belanger, David and Vernice Cohen, Joan Degerstrom, Bert and Patricia Ewers, Mr. and Mrs. John F. Kelley, Sherry and Frank Knott, Merrill O’Brien, Susan and Jim Palm, and Lorrie and Paul Scott. We invite you to stroll along the Walk of Stars to see all 55 names. A campaign is underway to honor beloved Spokane Symphony pianist and music educator, Kendall Feeney, with a sidewalk star. She passed away in March at age 58 from cancer. Kendall did so much to make music accessible and fun for students and audiences alike. So far, $14,600 has been donated toward the goal. To help fund Kendall’s star, visit spokanesymphony.org/kendall. The internationally renowned baritone gives four local students feedback & tips. November 4: 8 p.m. and 3 p.m. November 5 Overtures and Arias with Thomas Hampson, including selections from the American Songbook. This Latin jazz quintet has earned a national reputation for their explosive blend of Afro-Cuban rhythms and contemporary jazz improvisation. For information and tickets, call the Box Office at (509) 624-1200, or visit foxtheaterspokane.org. Tour The Fox! 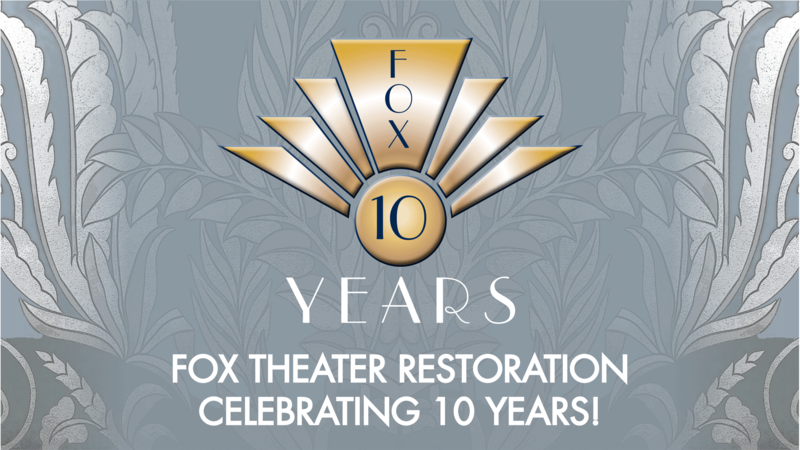 The Fox Theater restoration celebrates its 10th anniversary during November. Join us for a behind-the-scenes tour of The Fox on November 12 from 1-3:30 p.m. Spokane Symphony musicians will greet guests with selected works during the open house. Guided tours ($5) include the history of The Fox, its décor and murals, and a walk through the lobby, mezzanine, stage and backstage areas. Self-tours of the lobby, mezzanine and auditorium are open to the public. Tours are at 1, 1:50 and 2:35 p.m. Tickets available here or at the door. Published: Oct. 25, 2017, midnight Updated: Oct. 27, 2017, 11:59 p.m.